This page is written by the game's inventor, Changcai Chen. Cut out the 32 movement grid (4 colours with 8 pieces in each colour). Fold each movement grid (5x10 squares) at the middle and glue the 2 sides together to make a 2-sided playing piece. Another option is to cut it into two 5x5 squares and paste them on both sides of a 1 inch disc/chip. Cards-only version: Do not use the pieces, instead use regular chess pieces. Each player has 16 pieces â€“ 8 basic pieces (pawns), 1 king and the rest are advanced pieces. The costs of the pieces are pawn (1), knight (3), bishop (3), rook (5), queen (8). Each player may only have 8 pieces in play, including the king. Cut out the 75 cards and put them into card sleeves with real cards inside (2.5inch by 3.5 inch). Cut out the 16 board tiles (each is 2x2 squares). 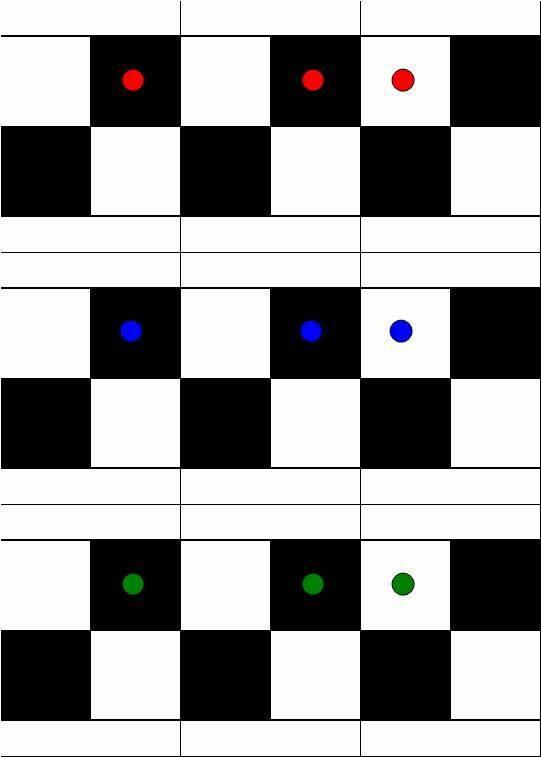 The circles on the squares mean that the square is a terrain of that colour. Standard chess board version: To play without board tiles, use an International Chess board and ignore the cards that affect board tiles. Each player chooses a colour and gets the 8 corresponding colored pieces. The movement grid on each piece shows how the piece can move and capture. 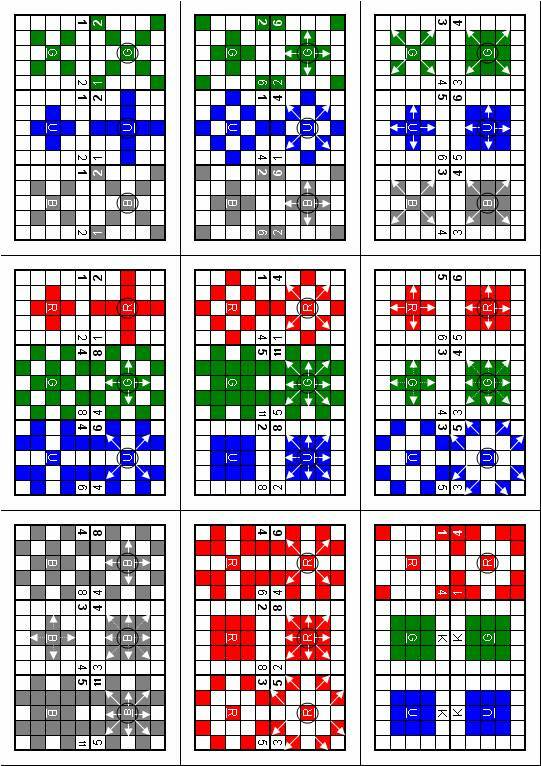 Deal the 16 board tiles with corresponding terrain to the players. If there are only 2 players, each player gets 4 more random tiles. Then, they take turns to place the board tiles. 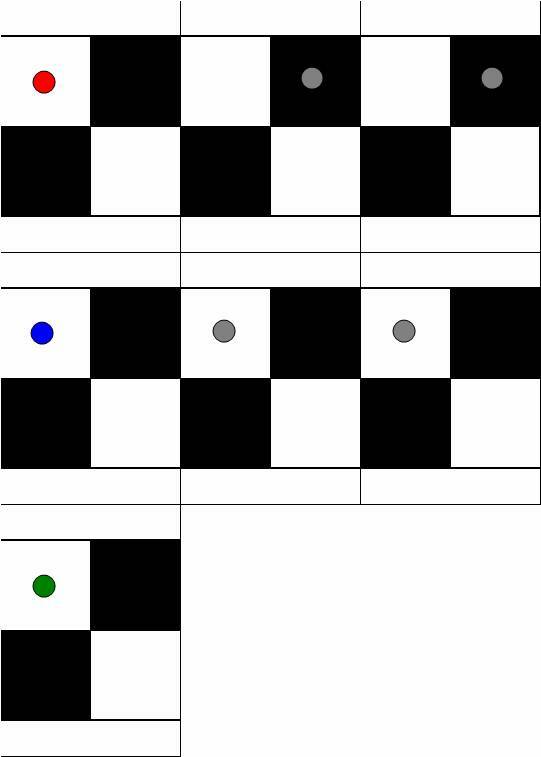 Similar coloured squares (black and white) cannot be adjacent, and each tile must be placed such that it joins to a placed tile at 1 square edge or more. Player may not place a tile that only touches the corner of a placed tile. 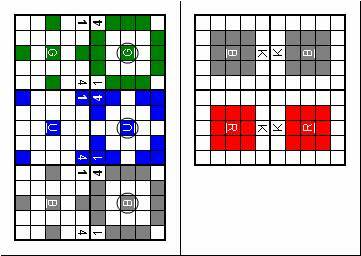 The last board tile placed should contain a terrain of the playerâ€™s colour. After each player places their last board tile, each player takes the side nearest to their last board tile and place their King piece on one of the 4 squares on this last board tile. This 2x2 region is the summoning board tile where the player can summon their pieces during the rest of the game. Place the 75 cards in an accessible location. This forms the common draw pile. To do these 3 actions, costs must be paid first, which means discarding cards equal to the cost face down to a common discard pile. The cost of the basic piece is shown on the top left corner of the movement grid, while the cost of the advanced piece is shown on the top right corner. The cost of promotion is the difference in cost between the advanced piece and the basic piece. Cost of a playing card is shown at the top right corner of the card. 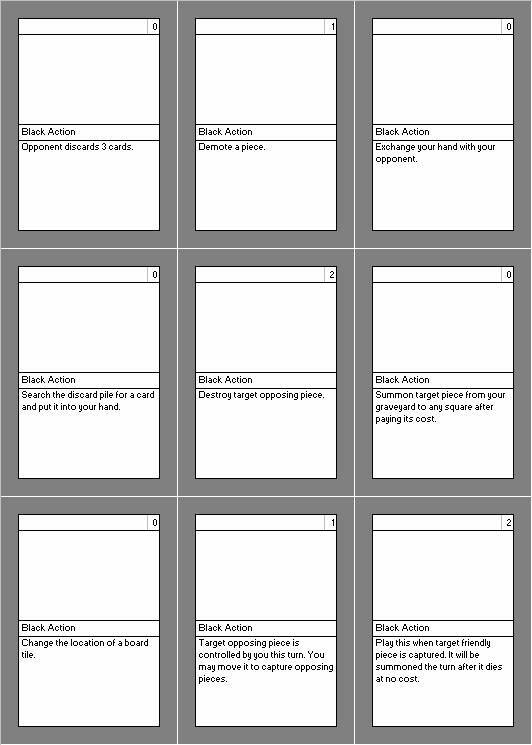 Whenever a card is played, the opponent may respond by playing a card. Cards are resolved first in last out. 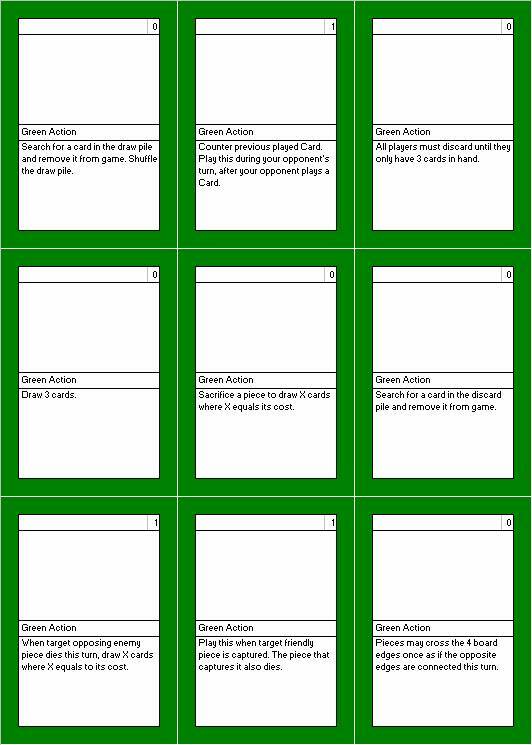 During opponent's turn, player may also play cards. 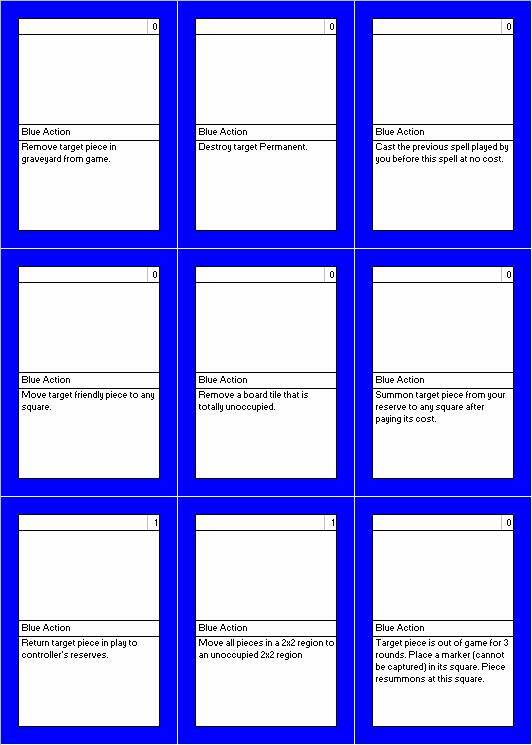 Pieces-only version: Do not use the cards. 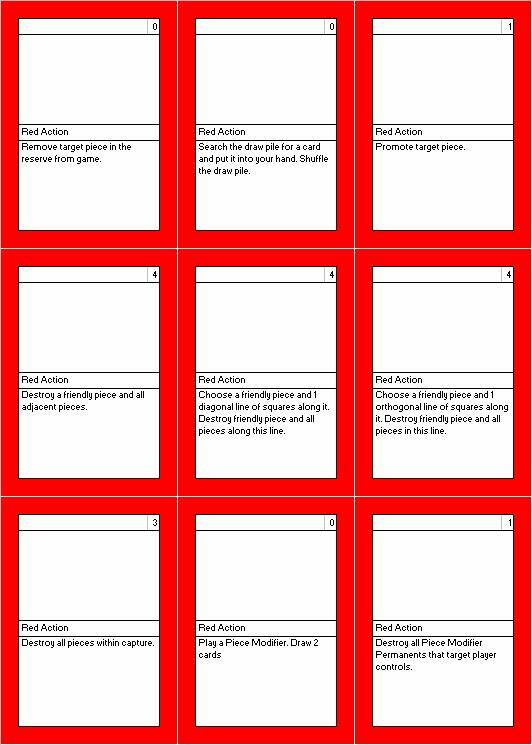 Each player gets 1 resource at the beginning of his turn. Use dice or glass gems to keep track of these resources. Resources are spent to summon or promote pieces. Advanced pieces have a circle at the center of the movement grid. A piece just summoned or promoted cannot move. 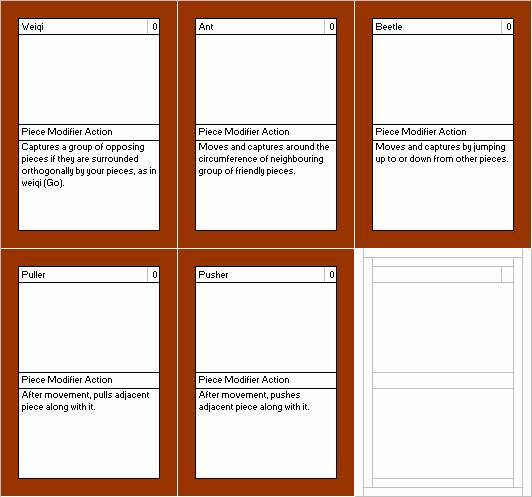 Player can also modify the movement, capture or interaction with opposing piece of a piece in play by paying the cost of a Piece Modifier Action card. 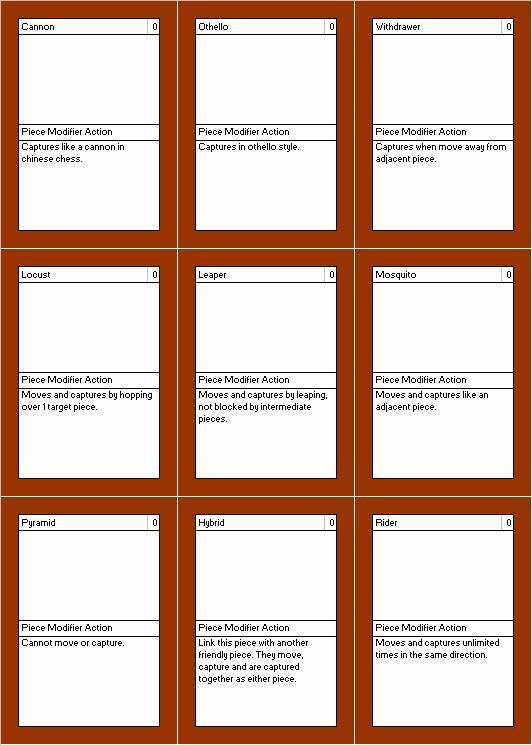 The effects of the modification lasts only the turn the card is played. 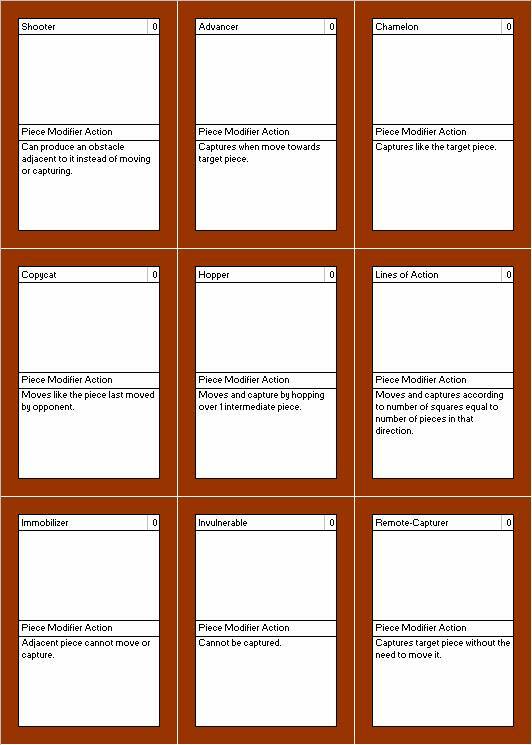 52-cards version: Do not use the Piece Modifier Action cards. Player may not move such that his and his opponent's moves repeat themselves the 2nd time. Unsummoned pieces are in each playerâ€™s reserve. When the pieces are captured (or destroyed), they are placed in each playerâ€™s graveyard. Player may not promote the piece such that it contributes to a checkmate. 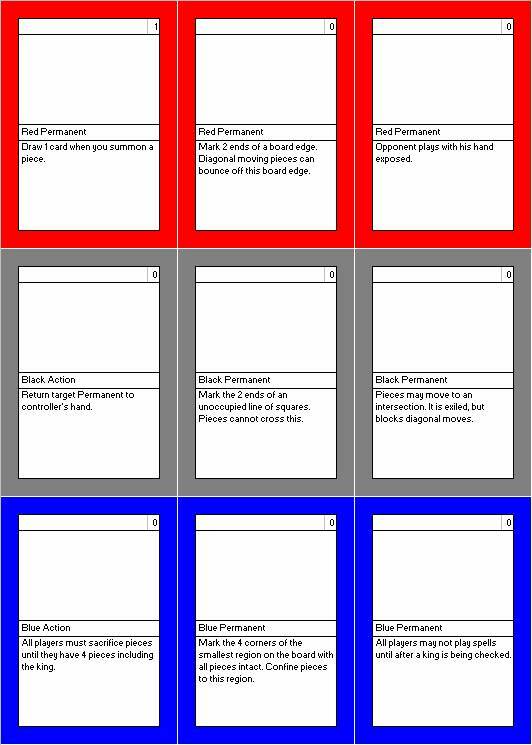 Players may play cards of their color and all Piece Modifier Action cards. There are 2 types of cards. Actions go to the discard pile face up immediately while Permanents stay in play in front of the player who played them. Kings cannot be targeted or affected by cards unless specified. Player may not play a card such that it contributes to a checkmate. Each 2x2 board tile has a coloured circle in one of the squares. The circle indicates the square as a terrain of that colour. 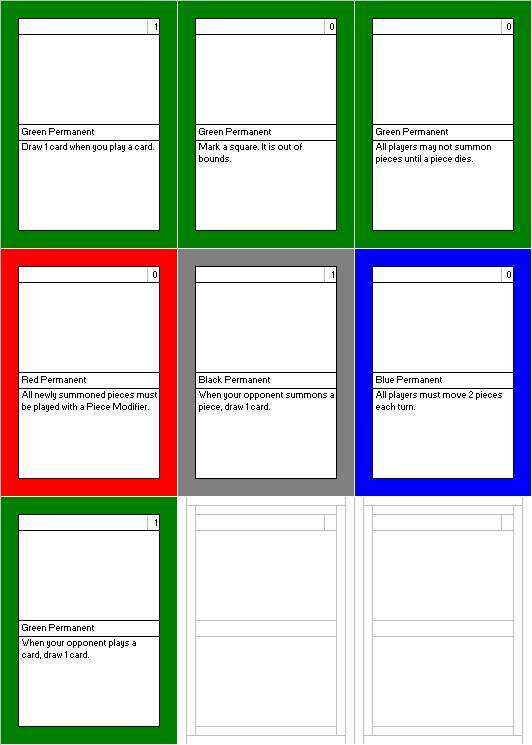 At the beginning of a playerâ€™s turn, if his pieces occupy all 4 terrains of his own colour, he can draw 1 more card. Standard chess board version: If playing without board tiles, flat and small chips having the 4 colours can be randomly placed on each 2x2 region. If chips are not available, just ignore rules involving terrain.